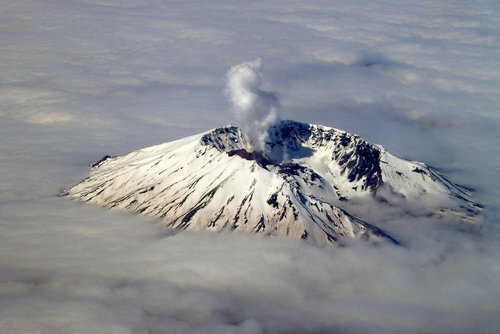 I just wrote an embarrassing story about my memory of Mount St. Helens erupting 30 years ago at my other blog. The memory reminded me of another one. My dad was taking flying lessons the same year the mountain erupted, and when it was allowed, he took my mom, me, and my great uncle up and around the crater. For some inexplicable reason, I fell deeply asleep in that one and only plane ride with my dad. I don't know if I was scared or sick, or if the plane had the same effect on me as riding in a car, which was to lull me to sleep. I was still a little kid, fascinated by the mountain, but a bit clueless about what an opportunity I was sleeping through. My uncle, however, woke me up long enough to get me to look out the window. The whole landscape looked like a black and white photograph. My uncle said, "Looks like licorice ice cream, doesn't it?" He was right. It looked like large mound of licorice ice cream melting, the black licorice stripes running slowly down the slope of the scoop. That's all I remember from what should be a momentous day. However, thinking of the cratered mountain as licorice ice cream made me think...how would you celebrate the 30th anniversary of the mountain's eruption? What food would you make for a volcano's anniversary party, especially a volcano that erupted without the ketchup-friendly lava, just miles of ash? Could you build a mound of licorice ice cream around some contraption that misted steam every few minutes? Could you turn gritty sugar cookies an ash color? Licorice tea could accompany a tall white cake with the center pulled out and replaced with gray frosting. Okay, it's a weird question, but now I want to cater a Mount St. Helens party. What could I serve to fit the theme?